Paste paper 4 or one of choice, apply your mask, delete and merge group. Paste frame 5, resize to 90%, free rotate to the left at 10, duplicate, mirror, move both frames, one to the left, the other to the right until they are how you like them, then merge down. Select your magic wand, click inside the frames, expand by 5, paste paper 2, invert delete, move below the frame. Resize your tube to 40%, paste on the right frame, mirror the original tube and paste in the left frame, delete both, select none, merge down. Duplicate the tubes in the frame, Gaussian blur at 4, change the blend mode to Screen. Resize your tube to 33%, paste in the center on top of the frame layer. Paste the paint splatter on the mask layer at one side, duplicate, flip, duplicate, mirror, duplicate flip and adjust all to fit your tag better. Paste the glitter layer under your tube layer, duplicate, mirror. Resize the mouse to 50%, mirror, paste above your tube layer on the right. Resize the balloons to 50%, place below the mouse and make it look like he is holding them by the hand. Resize the coin to 30%, place under the mouse, duplicate twice and move below the tube layer and one off to the right more and the other to the left more. Paste the sparkle above the paint splatters, duplicate, mirror and adjust. Resize the leprechaun on a horseshoe to 40%, place on the left below the wordart. Resize the goodie bag to 50%, place on the left below the tube layer. Resize the clover scatter to 50%, place on one side of the frame layer, duplicate, mirror. 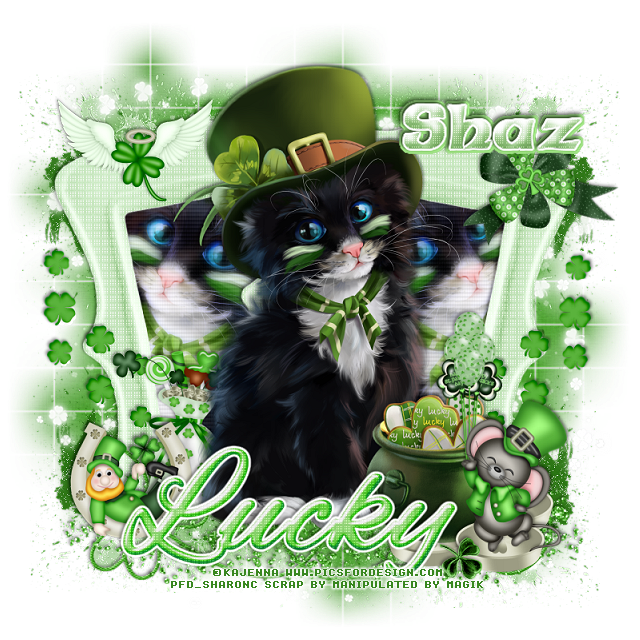 Resize the winged shamrock to 50%, place on the upper left on the frame. Resize bow 3 to 50%, paste on the upper right corner of the frame.